Salvadoran presidential hopeful Nayib Bukele, a former mayor campaigning as an anti-corruption outsider, was on track to win a first-round victory in Sunday’s presidential election, according to early results from the electoral tribunal. Bukele had 52 per cent of votes with returns counted from 34.4 per cent of polling stations, the electoral tribunal said three-and-a-half hours after polls closed. It was not immediately clear when a definitive result would be available. Bukele needs more than 50 per cent of votes to win the presidency outright, bringing an end to the two-party system that has governed the tiny country of 6.5 million people for three decades. Bukele, 37, has capitalized on the anti-establishment feeling sweeping elections across the region and farther afield, as voters seek an alternative to traditional parties. “The two groups that created the war still want to keep governing, and what’s more, they’re corrupt,” Bukele told reporters after voting in the capital. Outside of the hotel in San Salvador where Bukele waited for the results, a group of supporters set off fireworks, beat drums and danced as early figures came in. Pollster Mitofsky found in a January poll that Bukele had 57 per cent of voter support, while a poll by Gallup showed him with 42 per cent. Both polls showed ARENA’s Carlos Calleja in second place. El Salvador’s next president will face U.S. President Donald Trump’s criticism of Central American governments for not doing enough to prevent migration to the United States. He will also have to manage an American backlash against El Salvador’s recent establishment of diplomatic relations with China. At home, the new government will have to try to kick-start a sluggish economy, combat corruption and tackle one of the highest homicide rates in the world. Some voters said they were skeptical that Bukele has the experience to govern. Others said a third-party candidate is the only option for dramatic change. “We had 20 years eating trash with ARENA, and 10 years with the Front. 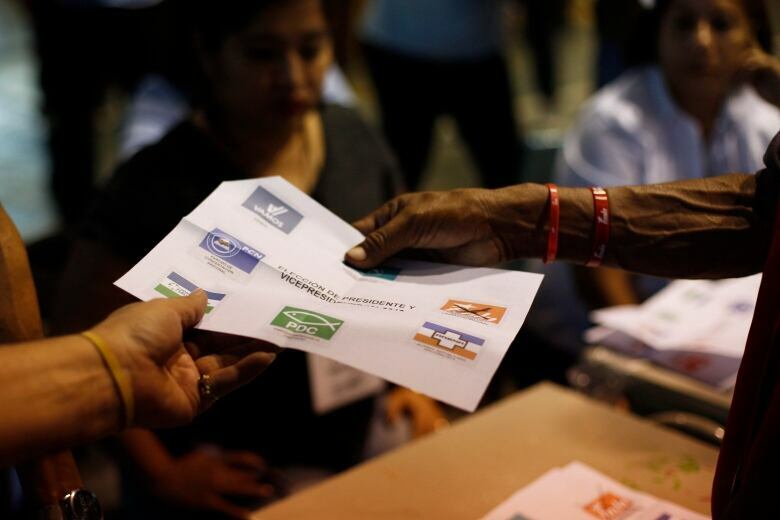 We have to vote for something different, and something different is this kid Nayib,” said driver Oscar Rosales, 46, a former FMLN supporter who voted at a school in the city of Santa Tecla, outside the capital. Entire families turned up at polling stations to vote, from parents with their children to older people in wheelchairs, in a calm atmosphere presided over by police. Bukele, who was San Salvador mayor between 2015 to 2018, wants to create an international anti-corruption commission with the support of the United Nations, following similar committees in Guatemala and Honduras. “We’ll create a [commission] … so that the corrupt can’t hide where they always hide, instead they’ll have to give back what they stole,” Bukele said in January. “A dictator is a dictator, on the ‘right’ or the ‘left,'” Bukele, who has a large social media following, wrote last week on Twitter.